500 | can i just finish my waffle? Things are really crazy on the ground here in DC…in an exciting and good way. We believe the turnout for this rally tomorrow is going to ASTOUND the country. The city is just PACKED to the brim with people already, today. Posted: 08.27.10 @ 4.11 p.m.
Video added 08.28.10 @ 2:21 a.m.
Update 08.28.10 @ 12:28 p.m.
Update 08.28.10 @ 12:51 p.m. Seeing is believing. Huge crowd. Totally peaceful. My fellow Americans. Wishing I could have been there. Video added 08.28.10 @6:15 p.m.
We could begin to restore honor by the mainstream media and others telling the truth – just tell the truth. Video added 08.28.10 @ 7:06 p.m.
Just got home from the rally. It was incredible. I was at the 9/12 event and incredibly, this was even bigger. 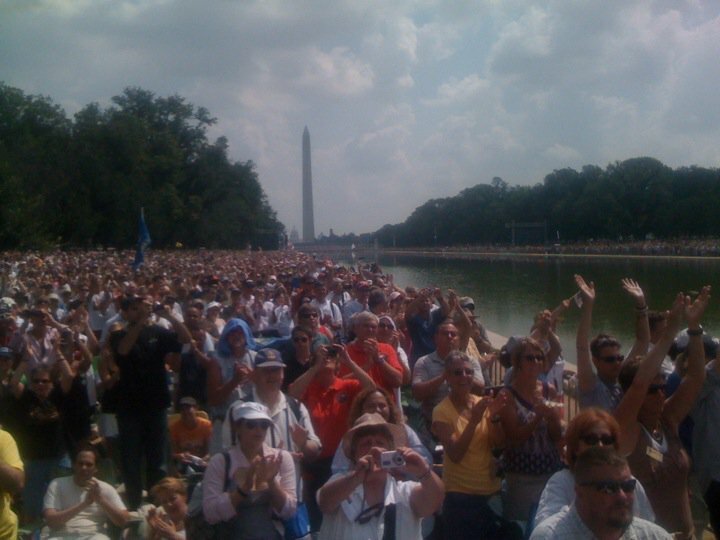 It was packed so solid from the Lincoln Memorial to the WWII Memorial (~ 3/4 mile?) that you could barely cross the mall to get to the port-a-potties. From the WWII Memorial to the Washington Monument (Another 1/4 mile?) it was packed also, but not quite as dense. Just as with all the other American patriot rallies, I saw no problems—and no garbage left behind. Lots of friendly faces. 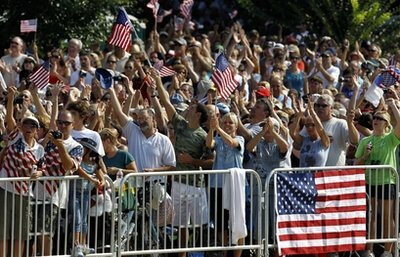 The most memorable moment: Reciting the Pledge of Allegiance and singing the Star Spangled Banner with a million others. Not many dry eyes—incredibly moving and a feeling I will never forget.